As a Greek bailout plan seems to be gravitating towards a yet again successful closure in its on-off year-long saga, the Greek stock market has been experiencing a robust rebound. It’s no secret that the Greek stock exchange has plummeted over the last three years. Its capitalization from over $220 billion in 2007, has fallen nearly 90% to under $28 billion in November 2011. Following recent optimism for a successful closure to the bailout package it is experiencing a remarkable rebound. As a result the Athens Stock Exchange General Index reached 840 points in February 17 compared to a low of 621 almost a month ago. By comparison at the end of 2009, just after the last elections and before the crisis erupted it was at 2,900 points. At this time banks were trading at five times more than current prices or at over 2-3 times book value. Off course since them much of the book value has been eroded due to the devaluation of state bond holdings and loan losses resulting from the economic crisis. There are some ways for US investors with risk appetite to gain exposure to the Greek crisis if interested. These are mainly the Greek ETF GREK and some very few stocks, mainly the National Bank of Greece (NBG). They might sound like a good opportunity for bottom fishing but be prepared that speculating here maybe a rollercoaster. 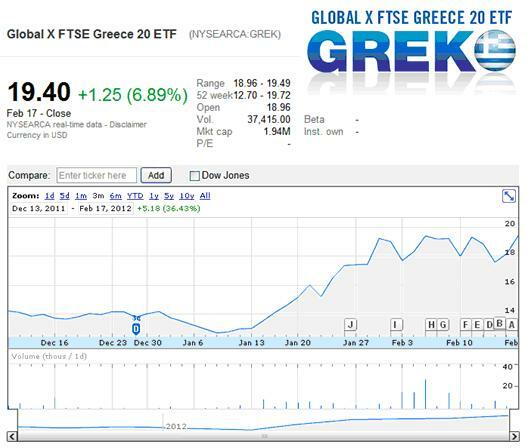 The GREK ETF tracks the FTSE/Athex 20 Index, which is comprised of the top 20 companies listed on the Athens Exchange by market capitalization. That limits, to the extend possible, risks from ASE’s low liquidity. GREK is heavy in banks (almost one third of its value) as well as some blue chip private companies, large utilities and state controlled companies. Greek banks in our opinion serve as a sort of hedge fund for small-size Greek companies and to some extent consumer and real estate market, albeit to lesser extend than US banks. Greek banks are coming back from the brink of collapse. If the Greek sovereign debt swap (PSI) and banks’ recapitalization takes place as planned, state funds will flow in in the form of common stock with limited voting rights. These common stocks could be bought back after an extended period; hence management will stay private and dilution will be limited. That’s not that bad of a solution after all; compared to the alternative of preferred shares, no coupon will be paid and at the same time the state can participate in future capital gains. Common stocks with extended voting rights however would be detrimental for stock prices even the banks themselves and the economy. Public corporations that are also heavily represented in GREK, have been largely earmarked for privatization. Hence they may realize some future gains resulting from the M&A process. They can also be benefited from increased flexibility in labor regulations and lower costs that are to be voted by the parliament. GREK was launched by Global Funds in December 7, 2011. 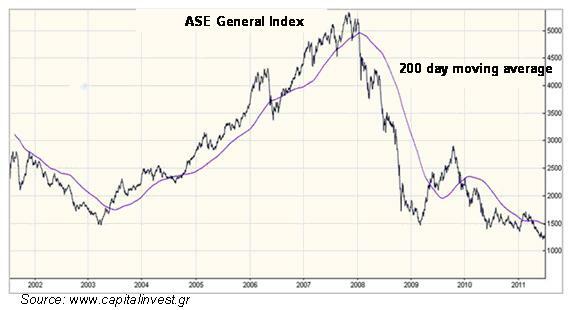 It should have been probably coming long time ago considering the media attention over Greece and ASE’s volatility. It offers the possibility for both institutional and retail investors to participate in the action. It also offers the possibility for diversifying existing portfolios in search for alpha solely from a quantitative perspective. Hopefully this will bring some attention and new investors to the Greek economy. It is traded in the NYSE (arca platform). 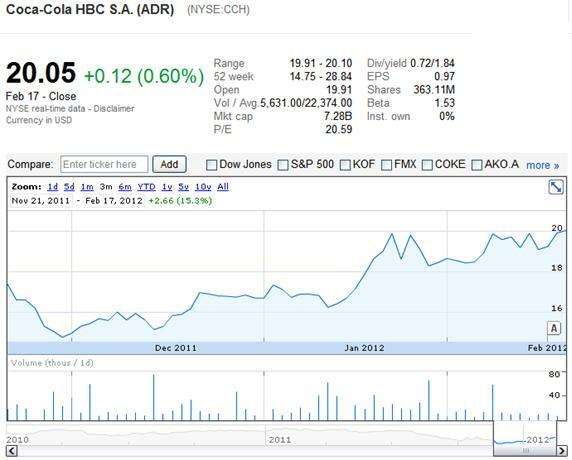 It has appreciated by 36% in its 3 months of existence to close at $19.4 on February 17 compared to $ 14.2 at launch. Its trading volumes are still relatively low however compared to other Greek stocks; maybe it’s not that very well known to investors yet. Another great way to invest in the Greek crisis is the National Bank of Greece (NBG) which is listed in NYSE through ADRs. Investing here however also bears the noise from the Greek banking sector’s recapitalization pains. The stock has been in a free fall over the last year but has rebounded considerably lately. 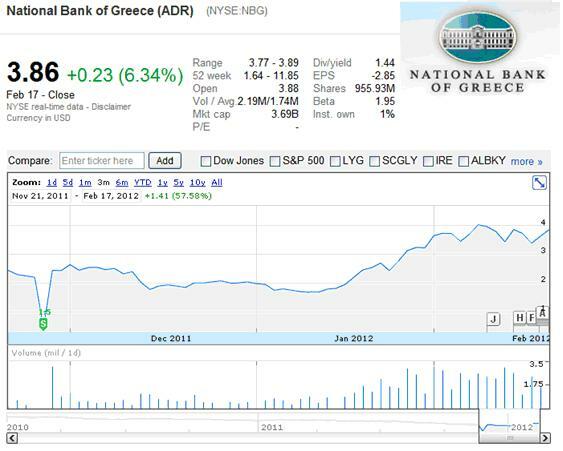 NBG’s ADR almost doubled since the start of the year in the midst of uncertainty over Greece’s fate. It closed at $3.86 on February 17 while its 52 week high is $11.85. It seems the worst are over for Greek banks as current rock bottom valuations and almost option-like features, reflect bankruptcy fears for the country and its banks, as well as severe shareholder dilution from recapitalizations. These scenarios seem to be out of the table for now. NBG is the largest commercial bank in Greece (no connection to the Central Bank of Greece although its predecessor) and is state controlled. Although Greek banks have been devastated by their exposure to the public sector under the legacy Greek economic model, they have relatively limited exposure to non-performing consumer and mortgage lending and satisfactory commission income. NBG’s main advantage lies in its exposure to the booming Turkish economy through its subsidiary Finansbank as well as subsidiaries in the developing southeastern economies of Bulgaria, Romania, Serbia, FYROM and Albania. A further benefit may arise from gradual flexibility in labor regulatory framework and wage decreases if current legislative proposals take effect. Coca Cola Hellenic Bottling Company (CCH) is one of the largest Coca Cola bottlers that is engaged in distribution in Europe. Its shareholders and managements are largely Greek. The stock has gained 17% since the beginning of the year. This stock doesn’t probably offer the highest exposure to the Greek issue, quite rightly so as it’s a blue chip consumer staples company with a strong brand name and diversified operations extensively outside Greece. Some other stocks that have seen action the last days whenever news about the Greek crisis were coming out, are Greek owned shipping companies. These are companies mainly based in Greece that have been listed in the New York stock exchanges since some time (due to Greek securities regulations shipping companies cannot or choose not to be listed in the Athens stock exchange). Shipping companies operate under complicated corporate structures often utilizing offshore holdings hence they have small exposure to the Greek economy and probably limited correlation as well, we may say. Moreover, their operations, revenues and expenses are denominated in foreign currencies; often in US dollars (crews are largely non Greeks). However, being or sounding Greek seems to offer some exposure for some investors. Companies in this category are Excel (EXM), Dry Ships (DRYS), Tsakos (TNP), Navios Holdings (NM) and Navios Partners (NMM), Diana (DSX), Euroseas (ESEA), Paragon (PRGN), Danaos (DAC), Costamare (CMRE), Star Bulk (SBLK), Safe Bulkers (SB), Freeseas (FREE), Seanergy (SHIP), Stealthgass (GASS), Aegean Marine (ANW) who are Greece based and to some extent Genco (GNK), Eagle (EGLE) who are headquartered in New York. Not all of the above are the same as they operate in different shipping segments (ie tanker, containers, dry bulk, marine fuel). 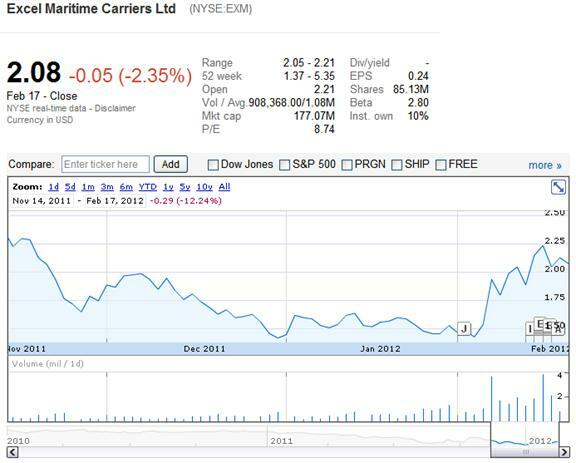 Excel for example who mainly operates dry bulk carriers trades at around 8-9 PE and its 52 week high is at $5. Greek shipping is huge but unfortunately for the country not that much connected to the economy, due to its offshore status. As said, speculating in these stocks in relation to the Greek crisis may only be offered for momentum trading and in the short tern in our opinion, while longer term potential should better depend on fundamental analysis. 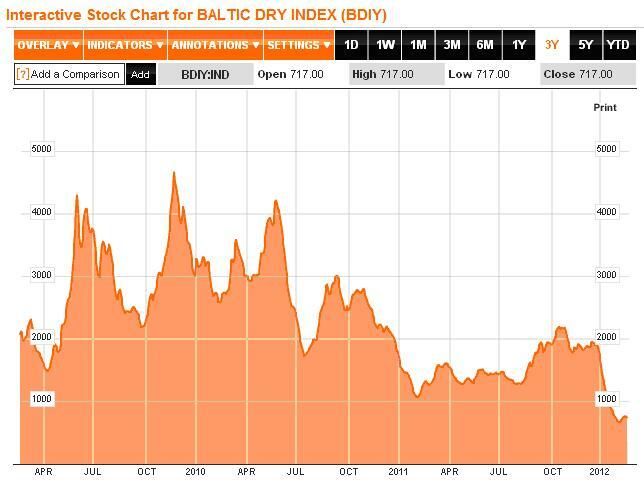 The shipping sector is in rough waters again; the Baltic Dry Index has plummeted recently maybe over concerns for China’s and Europe’s cooling. One then has also to drill down by bulk, tanker and container markets for a better analysis. Although the recent gains in the Greek stock market, this remains a very risky area, not recommended for the faint at heart. However, as history shows, most stock markets do rebound considerably after a significant crisis. It just then comes down to when one calls the bottom. By Pete Chatziplis, CFA, ACCA, MBA. The writer may trade positions in GREK, NBG, EXM and other stocks named here. The articles published here do not necessarily reflect the views of the Transatlantic Business Forum.